caroljeanl10 has no other items for sale. Soviet camera "Zenit-3M"+ 37mm lens "MIR-1". Minolta Maxxum 5000 SLR Film Camera. 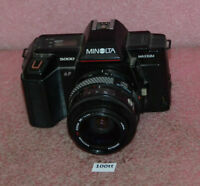 Minolta HI-MATIC 7 Camera - Rokkor PF 45mm f/1.8 - Rangefinder - Case and MORE!